CE-Series Mobile Cabinets - Our CE-Series cabinets were designed with mobile operations in mind. All four models are built from steel tubing with removable insert panels and Formica-clad counter top. They can be disassembled to lay flat for quick and easy movement from location to location. Available as a show model with light box marquee and mounting system or as a stand-alone cart which can be paired with a plex shield and filtration hood. A CE-Series cabinet with attractive light box display instead of overhead filtration hood. Option available without light box or mounting poles. Suitable for mounting plex shield and filtration hood. AFS-Series Advanced Filtration Cabinets with Built-In Automatic Fire Suppression - If your indoor location requires advanced filtration, we've got you covered. Our down-draft system is fully contained in the base of the cabinet, eliminating overhead ventilation and expensive installation at your location. Shown is our NEW model AFS12 system for our model SS1200 donut machine, mounted in a beautiful stainless steel cabinet. Not compatible with gas-fired machines. FSC-Series Vendor Carts - Our top-of-the-line vendor cart has plenty of attention-getting features such as illuminated canopy, gleaming stainless steel counter top, plex enclosure and more! Combine our beautiful and functional FSC-10 Vendor Cart with your choice of plex shield/filtration hood combos to create the perfect indoor or outdoor operation. Cart can be used with any of our donut machines or the Uni-Matic II. Our stainless steel FSC-10 vendor cart with the added benefit of our downdraft filtration and fire suppression system. 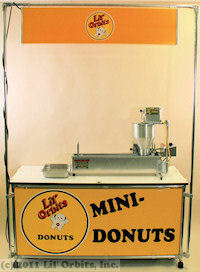 Other Cabinets - Lil' Orbits also offers a full line of cabinets and carts to suit many other concession needs. Check out our Mini Express Cabinet, designed to put your Semi-Automatic Model 800 machine in full public view. Our CE100 companion cart is an attractive addition to your setup, creating a convenient location for storage underneath as well as a convenient space atop for mixer, cash register or other item. Need extra storage and counter space? The SS2403 cabinet will give you a full 6" of storage space in attractive yellow and white Formica. Custom Cabinet Options - All of our cabinets are available in custom color or vinyl image wrap options. Click to view samples and ordering information. Do I need filtration and what are my options? It depends on the situation where you are operating your equipment. Your business advisor can help you figure out what is required for your food operation. Mount atop a plex shield with quick-disconnect fasteners. All of our downdraft cabinets come with an automatic fire suppression system designed to meet indoor fire codes. The down-draft filtration and automatic fire suppression system are available in our AFS and FSC-Series carts and are designed to work with out SS1200 and SS2400 electric mini-donut machines. For safety and health reasons it is best to surround your food operation with a clear plex shield. We have five sizes available to fit any combination of machine and cabinet. Don't need a filtration hood? Hang a brightly lit display marquee in its place. Translucent yellow background with color logo. Includes brackets for hanging. Click here to go to our complete product list for more accessories and supplies.